This kit recognizes natural and some recombinant Rat TG. No Significant cross -reactivity or interference between Rat TG and analogues was observed. Small volumes of TG elisa kit vial(s) may occasionally become entrapped in the seal of the product vial during shipment and storage. If necessary, briefly centrifuge the vial on a tabletop centrifuge to dislodge any liquid in the container`s cap. Certain products may require to ship with dry ice and additional dry ice fee may apply. MBS2515791 is a ready-to-use microwell, strip plate ELISA (enzyme-linked immunosorbent assay) Kit for analyzing the presence of the TG, ELISA Kit target analytes in biological samples. 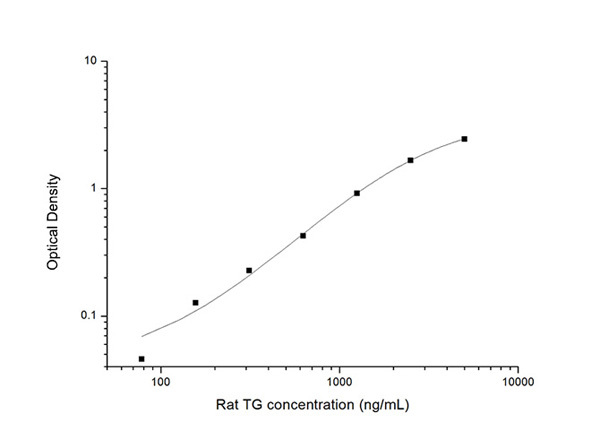 The concentration gradients of the kit standards or positive controls render a theoretical kit detection range in biological research samples containing TG. The ELISA analytical biochemical technique of the MBS2515791 kit is based on TG antibody-TG antigen interactions (immunosorbency) and an HRP colorimetric detection system to detect TG antigen targets in samples. The ELISA Kit is designed to detect native, not recombinant, TG. Appropriate sample types may include undiluted body fluids and/or tissue homogenates, secretions. Quality control assays assessing reproducibility identified the intra-assay CV (%) and inter-assay CV(%). Intended Uses: This ELISA kit applies to the invitro quantitative determination of RatTGconcentrations in serum, plasma and other biological fluids. Principle of the Assay: This ELISA kit uses Sandwich-ELISA as the method. The micro ELISA plate provided in this kit has been pre-coated with an antibody specific to TG. Standards or samples are added to the appropriate micro ELISA plate wells and combined with the specific antibody. Then a biotinylated detection antibody specific for TGand Avidin-Horseradish Peroxidase (HRP) conjugate is added to each micro plate well successively and incubated. Free components are washed away. The substrate solution is added to each well. Only those wells that contain TG, biotinylated detection antibody and Avidin-HRP conjugate will appear blue in color. The enzyme-substrate reaction is terminated by the addition of a sulphuric acid solution and the color turns yellow. The optical density (OD) is measured spectrophotometrically at a wavelength of 450 nm +/- 2 nm. The OD value is proportional to the concentration of TG.You can calculate the concentration of TGin the samples by comparing the OD of the samples to the standard curve. TG: Precursor of the iodinated thyroid hormones thyroxine (T4) and triiodothyronine (T3). Defects in TG are the cause of thyroid dyshormonogenesis 3 (TDH3). A disorder due to thyroid dyshormonogenesis, causing large goiters of elastic and soft consistency in the majority of patients. Although the degree of thyroid dysfunction varies considerably among patients with defective thyroglobulin synthesis, patients usually have a relatively high serum free triiodothyronine (T3) concentration with disproportionately low free tetraiodothyronine (T4) level. The maintenance of relatively high free T3 levels prevents profound tissue hypothyroidism except in brain and pituitary, which are dependent on T4 supply, resulting in neurologic and intellectual defects in some cases. Variations in TG are associated with susceptibility to autoimmune thyroid disease type 3 (AITD3). AITDs including Graves disease (GD) and Hashimoto thyroiditis (HT), are among the most common human autoimmune diseases. They are complex diseases, which are caused by an interaction between susceptibility genes and nongenetic factors, such as infection. Belongs to the type-B carboxylesterase/lipase family. 2 isoforms of the human protein are produced by alternative splicing. 1. Data suggest that serum thyroglobulin levels are up-regulated in patients with well-differentiated thyroid cancers as compared to patients with benign thyroid nodules.